I love visiting local roasters and cafes to buy coffee beans, but with our busy lives, there is an undeniable appeal to the idea of ordering coffee online and having it shipped directly to your door. You generally will have one of two options for doing this: ordering directly from a coffee roaster, or ordering through a coffee subscription service. Both methods have their positive and negative points. With rare exceptions, almost every coffee roaster I’ve ordered beans from online have roasted to order and shipped the coffee within 1 day of roasting (the only exceptions have been LaMill and La Colombe). You’re ordering directly from the roasters themselves so you’re likely to get more information about the coffee you’re drinking (things like tasting notes, background on the farms, etc. ), and occasional promotional offers if you sign up for their mailing lists (free shipping offers, discounts, etc.). Some roasters roast 5-7 days a week, and some smaller roasters only roast 1-2 days a week. If a roaster only roasts on Mondays and Thursdays, and you place an order on Thursday night, they won’t roast your order until the following Monday, ship perhaps Tuesday, and you might not receive your beans until Thursday or Friday (in the US). That’s over a week between “oh no I’m almost out of coffee!” and actually receiving it. Incidentally, this is why I almost always do online coffee ordering on Sundays, because I’ve found most coffee roasters roast on Mondays or Tuesdays and I want to be sure my order is in the queue in time! If you don’t have a handle of what sort of coffee you like, it’s easy to get overwhelmed by all the options. Craft coffee can be intimidating and it’s nice to get advice from someone knowledgeable. This is a great reason why buying at a coffee shop is a good idea – the baristas are often happy to “talk shop” and give their opinions on what sort of beans you might like best. They will ship coffee on a predetermined schedule (biweekly, monthly, etc.) that you can alter as you wish. You tell them your taste preferences and they’ll pick a coffee for you – either one of their specially formulated blends/roasts, or they’ll pick a coffee roaster they think you’ll like. Great for indecisive folk or for people that don’t feel they know enough about coffee to choose their own. You typically won’t get to select a particular roaster or origin if you’re wanting something specific. Only really a problem if you’re already very knowledgeable about coffees and origins. Good subscription companies will endeavor to have the coffees shipped to the customer within days of roasting but sometimes it takes a bit longer, and the coffee might arrive at the end of its peak freshness window. The cons are why my membership with a particular coffee subscription service back in 2015 was short-lived, and I haven’t come across another company that provided what I was looking for: a carefully curated collection of coffees from nationally respected coffee roasters, that I could guarantee would arrive freshly roasted, with no commitment required. Javaya reached out to me through the contact form on my blog. When I checked out their site, I was very pleasantly surprised to see that they partner with some VERY respected coffee roasters – as soon as I saw Metropolis and Onyx Coffee on the list, I knew I was dealing with people that knew what great coffee is! I haven’t heard of all of the roasters that they feature, but I know enough of the ones that I have heard of to know that Javaya has a high standard for what roasters they’re going to recommend to customers. So how does Javaya work? Here’s how it goes: You start on the home page and click “Find Your Perfect Roast” which will take you to their Virtual Barista page. 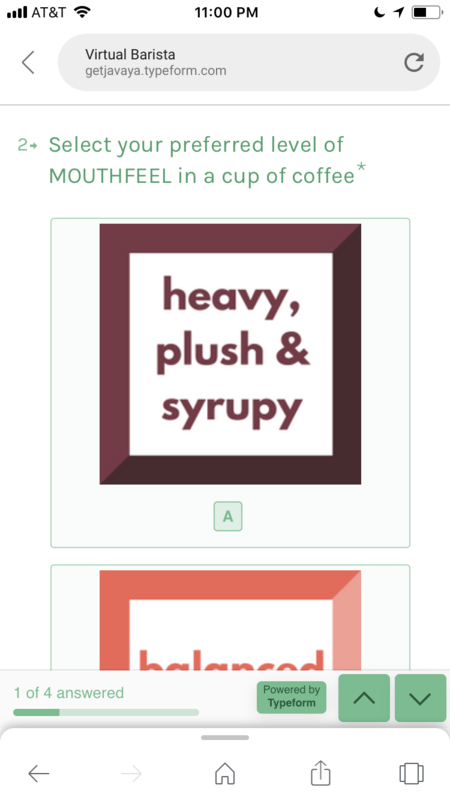 The Virtual Barista will ask you 3 questions which will help them determine what makes up your ideal cup of coffee. The format reminds me a bit of a Buzzfeed quiz, with the square boxes and fun fonts/colors. 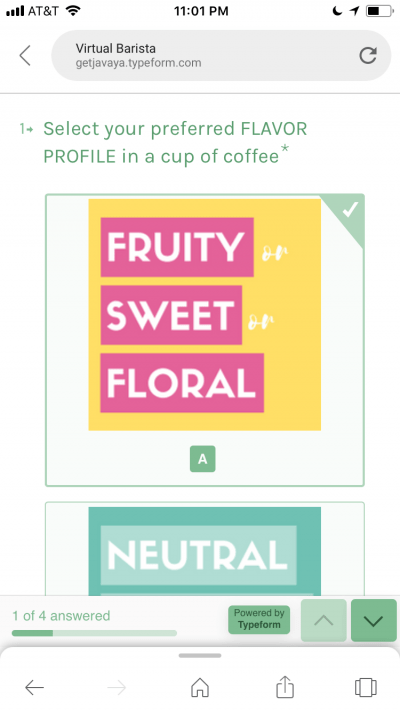 Once you click “See My Results,” the Virtual Barista will list a selection of coffees from a variety of roasters that it thinks will fit your preferences. If you want to expand the search to include more results, you can check tick-boxes on the left side of the screen to include more categories. From the selections I was given, I chose the Onyx Coffee Lab Ethiopia Guji Uraga, which I’ll review in a separate post. The thing I liked best about this whole process was the ability to choose a “Future Fresh” date, which allowed me to dictate when I wanted these beans to be roasted. They were then shipped and delivered to me in a matter of just two or three days (using the free shipping option). This is just as fast as it would be to order from the roasters directly (and the price seemed quite competitive too!). I’ll go more into detail about the beans themselves when I get to the Onyx review, but there was no discernible difference between ordering these beans through Javaya vs. directly from Onyx, or buying a fresh bag in a local retailer. These beans are top notch, and I am totally sold on this business model. Javaya is NOT a subscription service – they won’t “Columbia House” you by making you pay for unwanted deliveries that you forgot to cancel. You get suggestions, but ultimately YOU get to make the final decision as to what roaster you’re going to try and what origin you want to drink, and this suits me perfectly because while I like the idea of being introduced to new things, I don’t want someone else picking my coffee for me. And, the price is comparable (or sometimes even cheaper!) than ordering directly from the roasters’ websites, because Javaya always offers free shipping. So, if you’re like me and don’t like being locked into contracts/subscriptions, and like the idea of having a carefully curated selection of coffees just for you, free shipping, AND a money-back guarantee, check out Javaya (rhymes with Mariah, like Mariah Carey)! 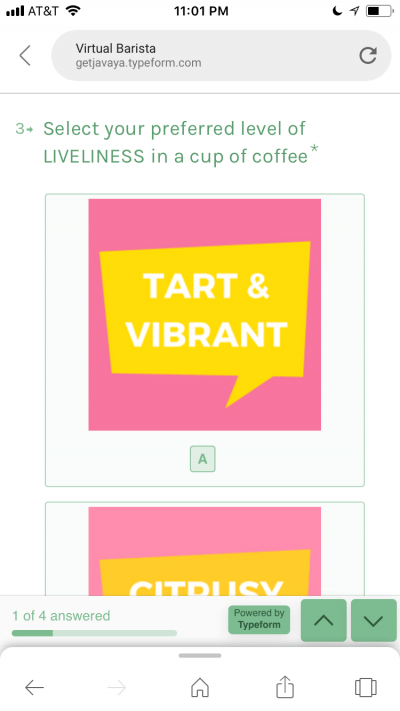 I don’t promote anything on this website for pay, but I will say that I’ve already placed an order for a second bag from Javaya – that’s how impressed I was by them and their coffee selection! Pro tip: If you scroll to the bottom of their website and sign up for Javaya’s newsletter, they’ll send you a coupon code for $5 off your first order. Disclaimer: I wrote this review in exchange for trying out Javaya’s service with a discount code; this is not a sponsored/paid post. As always, these are my honest thoughts about the product/service.